Jackson Square in the French Quarter | Experience New Orleans! Historic Jackson Square, originally known in the 18th century as "Place d'Armes," and later renamed in honor of the Battle of New Orleans hero Andrew Jackson, is a timeless attraction in the heart of the French Quarter of New Orleans. This famous landmark facing the Mississippi River is surrounded by historic buildings, including the St. Louis Cathedral, the Presbytere and Cabildo (Louisiana State Museums), not to mention the Lower and Upper Pontalba Apartments, the oldest apartment buildings in the United States. The Pontalba Apartments offer retail shops, museums, galleries and restaurants on the ground level; their second and third floors still house a selection of prestigious apartments. Jackson Square is a favorite site for visitors and locals. The artists, restaurants, museums, merchants and the square itself make Jackson Square one of the French Quarter's most popular destinations. Jackson Square is open seven days a week. During daylight savings time it's open from 8am to 7pm. During winter, it's open from 8am to 6pm. Finding Jackson Square is really quite simple. It is on the Mississippi River, on Decatur Street, between the Jax Brewery Shopping Mall and the French Market, in front of the St. Louis Cathedral. Across the street from the Square, you'll find the world-famous Café Du Monde. If you are in the vicinity of the Convention Center, you can just hop on to the Riverfront Streetcar, and it will let you off at Jackson Square. 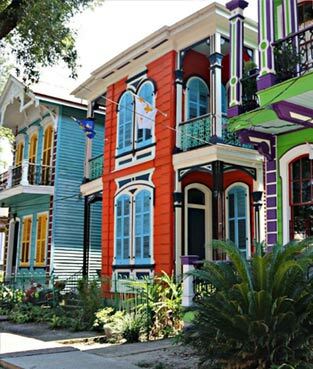 If you are in other parts of the city, just head for the French Quarter. Directly in front of the Square, you can find carriages offering rides around the Quarter. 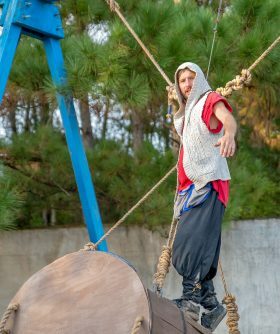 In the Square, you'll find amazing artists who can create a beautiful souvenir and street performers that will keep you entertained. FAQ: How can I get married in Jackson Square? Answer: Contact the Parks and Parkways Dept. for the City of New Orleans. Their phone number is 504-658-3200, or you can email them at parksandparkways@cityofno.com. On the City of New Orleans website, Parks and Parkways page, there is a link to the form that must be completed and submitted. View guidelines for photography for all professional, staged, planned and formal sessions. When New Orleans was founded, it was nothing more than a French trading camp. After a few years, the camp was organized into a formal colony, and was subdivided into "city blocks," with streets that ran perpendicular and parallel to the Mississippi River. In the center of this layout, right on the river, was a one-block common area: the Place d'Armes, designed by architect Louis Pilié. The Place d'Armes (or Plaza de Armas, as the Spanish called it) was used as a public square, military parade ground and open-air market. 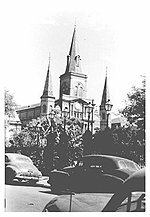 On the northwest side, Chartres Street, stood a church (now Saint Louis Cathedral) and the governor's mansion (the Cabildo). Because of its central location, proximity to the river port, and the presence of both a church and seat of government, the square was the epicenter of New Orleans life and the hub of local shipping and commerce. The Place d'Armes continued to function in this capacity throughout the rule of the French, the Spanish, the French again, and American rule after the Louisiana Purchase. Following the Battle of New Orleans in 1814, the Baroness Pontalba (builder of the Pontalba Apartments, which bear her name and remain in use today) lobbied for and financed a redesign of the public square. The new design incorporated an iron fence, formal gardens, walkways and benches for sitting. 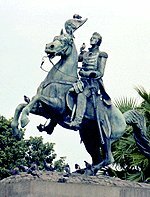 In the center of the square stands one of three bronze statues of General Andrew Jackson, hero of New Orleans. In 1815, after the Battle of New Orleans, the square was renamed "Jackson Square" in the general's honor. Throughout the 19th and 20th centuries, and now into the 21st century, the area surrounding Jackson Square has contained a mix of commercial and residential property. The Cabildo, the Presbytere (on the opposite side of the cathedral), and one of the apartment townhouses of the Lower Pontalba Apartments are now state museums. The lower floors of the apartment buildings are shops and restaurants, while the second and third floors are residential apartments. For well over half a century, an open-air artist colony has thrived at Jackson Square, with artists painting and displaying their work on the outside of the iron fence. Under the shade of the oak trees, you can sit and have a pastel portrait done in about one hour, and you will be hard-pressed to find better portrait artists working outside anywhere else in the world. Until 1971, the streets that surround Jackson Square were just that: streets, with parallel parking on all sides, except for Chartres St, where there was angle parking. In 1971, the streets of Chartres, St. Peter and St. Ann were closed off to serve as a pedestrian mall. By 1974, the construction of the mall was complete, with slate flagstone paving the ground from the square's flanking buildings to its fence. Today, visitors and local residents alike enjoy strolling and sitting on the mall's benches, watching the artists at work or just enjoying nice weather with a drink or some ice cream. Adjacent to Jackson Square on the Mississippi River are the Shops at Jax Brewery, the Washington Artillery Park river overlook, and the French Market complex. Jackson Square has been the site of numerous movies, live television network broadcasts, and New Year's Eve celebrations, and remains the number-one destination for visitors to New Orleans.